We can’t wait for this one! What could be better than pairings of wine and BBQ! Yumm! 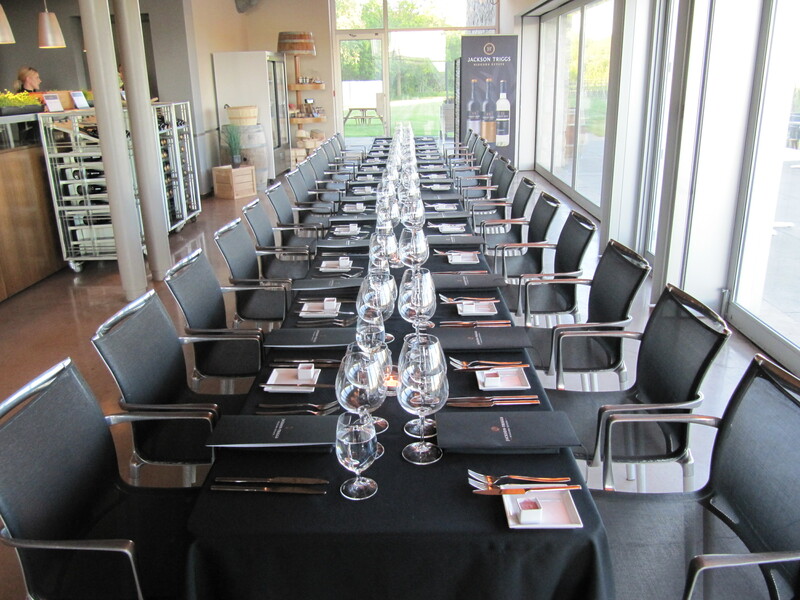 A few months ago, I was the lucky winner of a Savour the Sights dinner (contest held by Embrace Niagara) at Jackson Triggs in Niagara on the Lake. We decided to pair it with the Wine & Herb festival this past weekend and made a weekend of it. 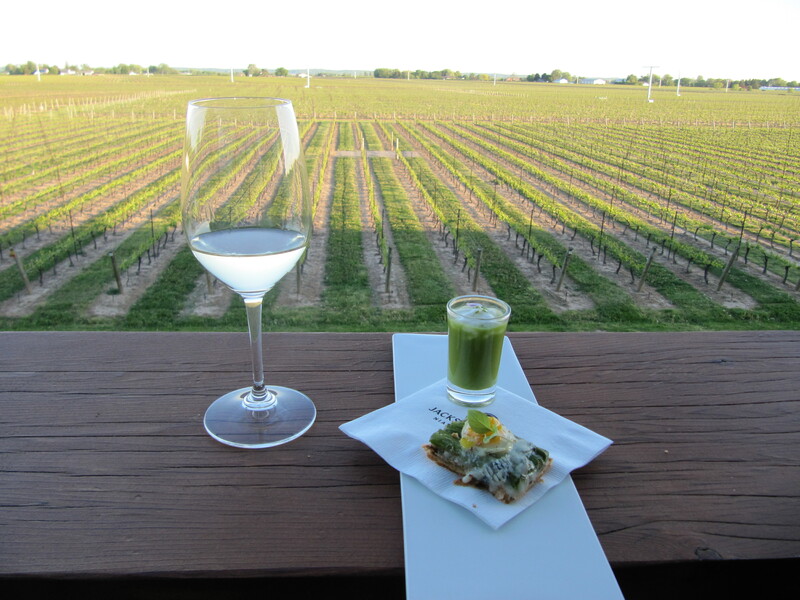 The Wine & Herb passport allows you to visit 20+ wineries to sample a pairing. Each winery is assigned an herb and their pairing consists of an hors d’oeuvre inspired by the assigned herb with a wine tasting. We checked into the hotel to freshen up before heading out to Jackson Triggs for dinner! We were warmly welcomed at the winery and handed a seemingly bottomless glass of sparkling wine which we enjoyed in the Great Hall with about 12-14 other guests while hors d’oervres were passed. 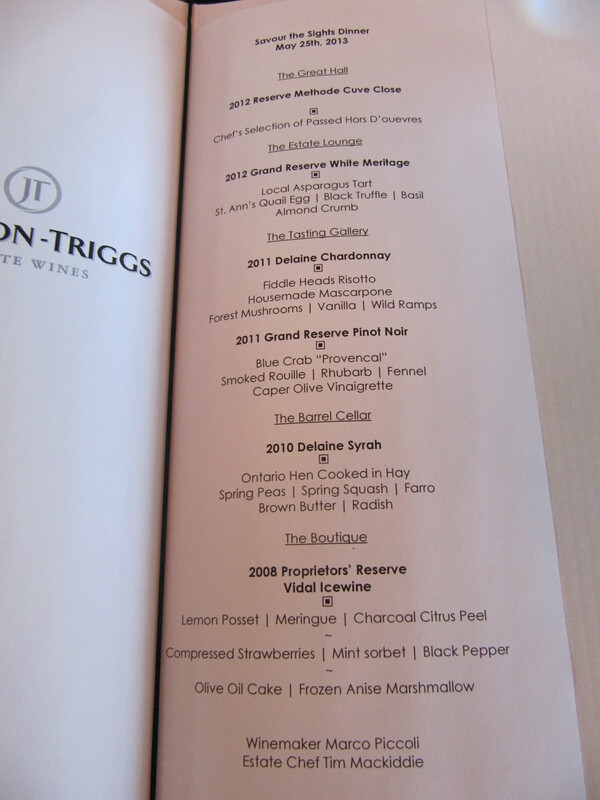 Note that I’ve posted a pic of the menu for the evening down below which contains the details of the wines and courses. Graham and Paul were the hosts and were awesome throughout the evening. Graham provided some history about the winery – we were interested to learn that Mr. Jackson and Mr. Triggs were from the Labatt wine division of yore. 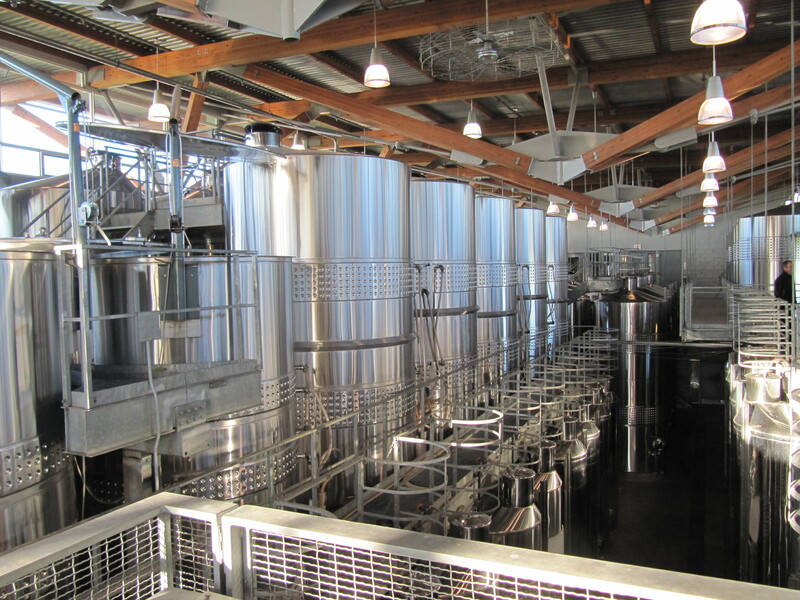 Paul then gave us a tour of the facility and explained the grapes and winemaking process. Paul made the tour really fun and informative at the same time. 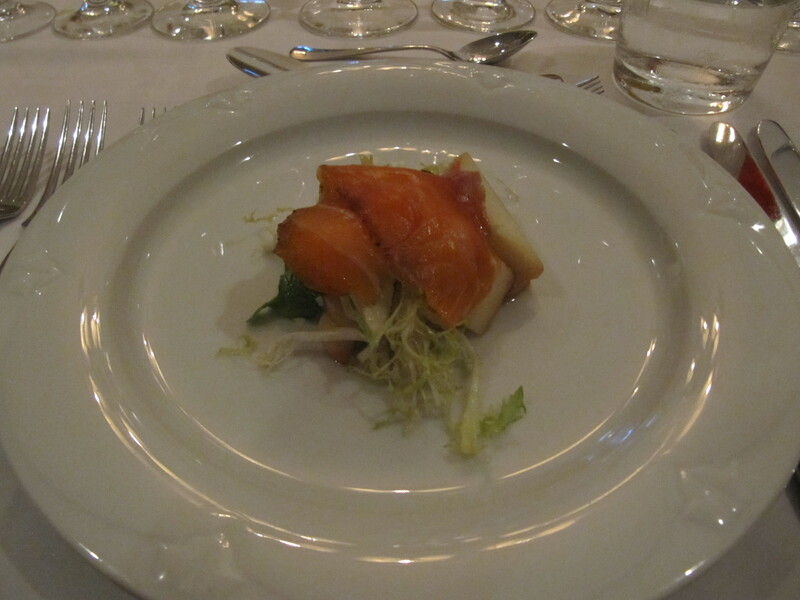 Another Sparkling (Sauvignon Blanc based) paired with a vibrant amuse-bouche of salmon sashimi – very tasty and the citrusy wine was fantastic. 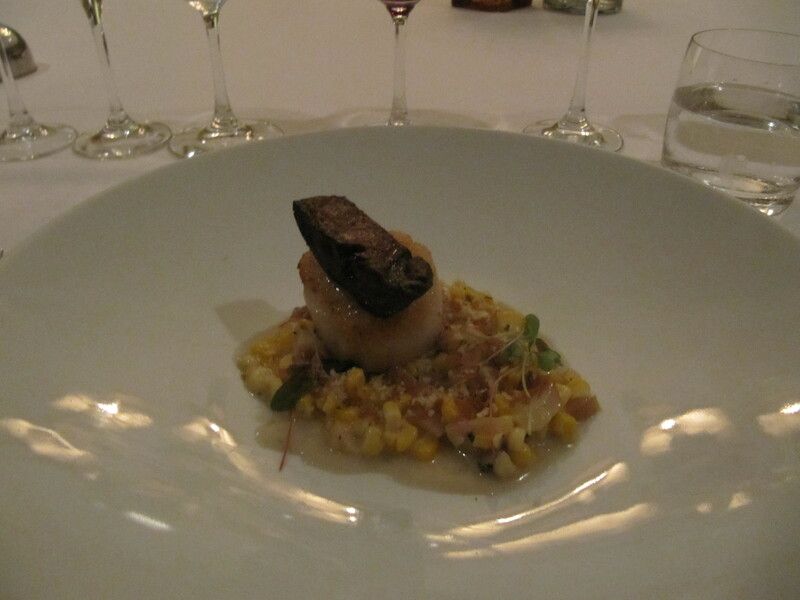 Then we moved inside for 2 more courses. The chef Tim Mackiddie introduced each course with such enthusiasm – everyone at the table was eager to dig in after his passionate intro! 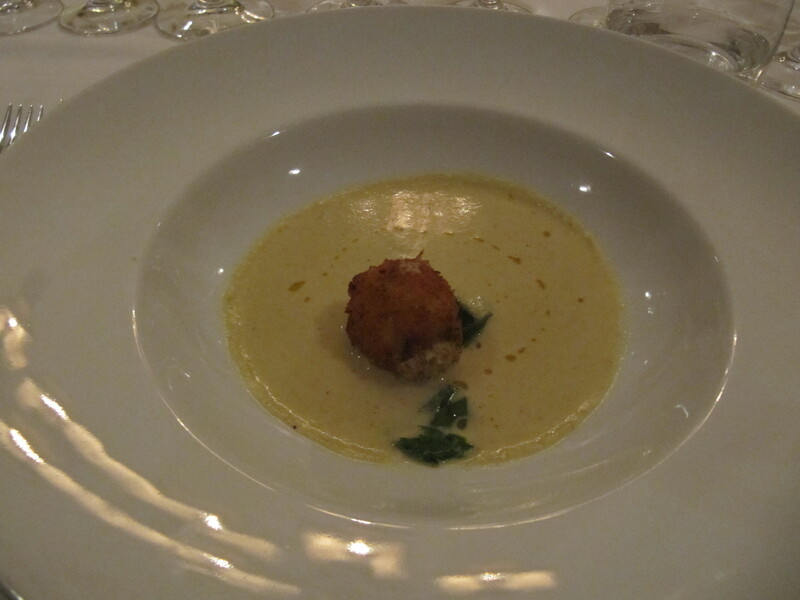 Followed by a Pinot Noir paired with a blue crab cake with rhubard and fennel (sorry no pic – I dug in too quickly!). 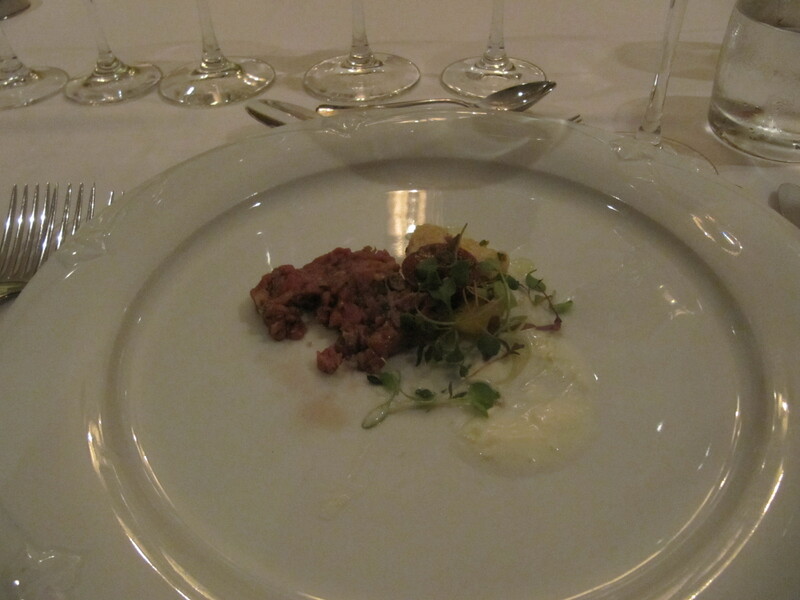 We were then led to the Barrel Cellar for the main course which was a Syrah paired with an Ontario hen cooked in hay with spring peas and spring sqaush. The hen was delicious – so moist! 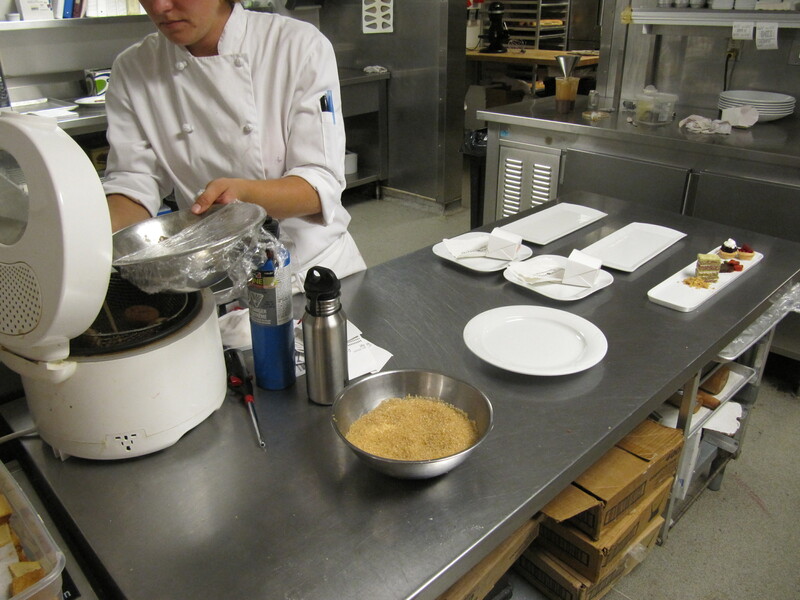 The chef explained how they cooked it in hay to retain the moisture – very cool! 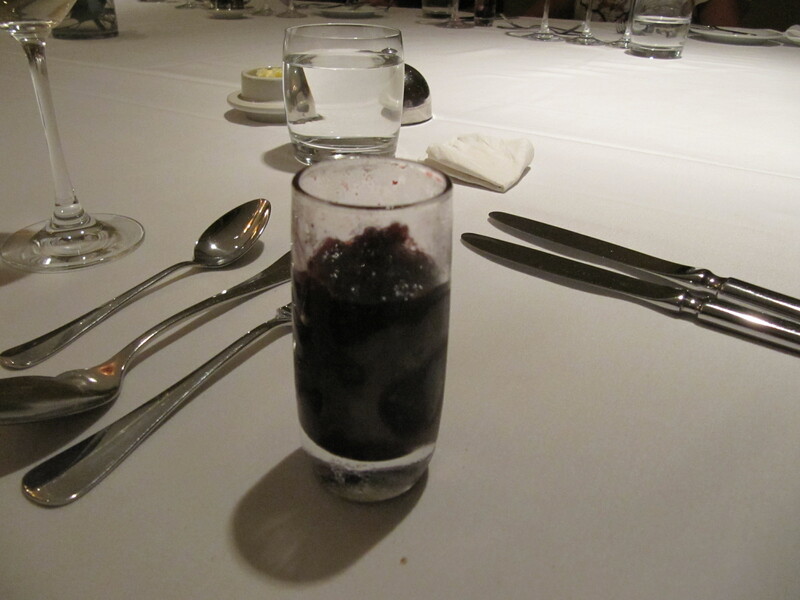 Then, up to the Boutique for the dessert party where we enjoyed a Vidal Icewine with several passed dessert bites. It was a fantastic event – I can’t say enough about Jackson Triggs. 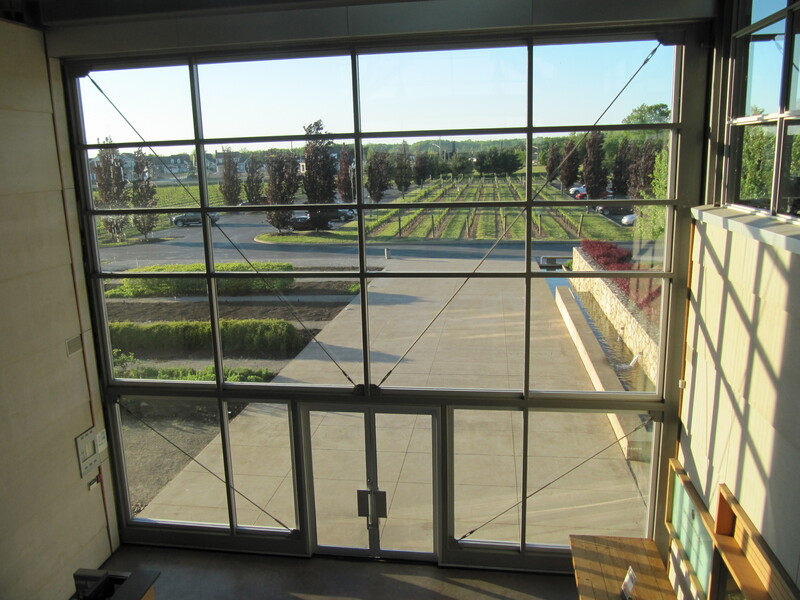 The meal and wines were excellent as was the tour of the facility and the vineyard views were spectacular. Our hosts Graham and Paul were awesome and made our night very special. Our fellow guests were great as well – we met some wonderful people. 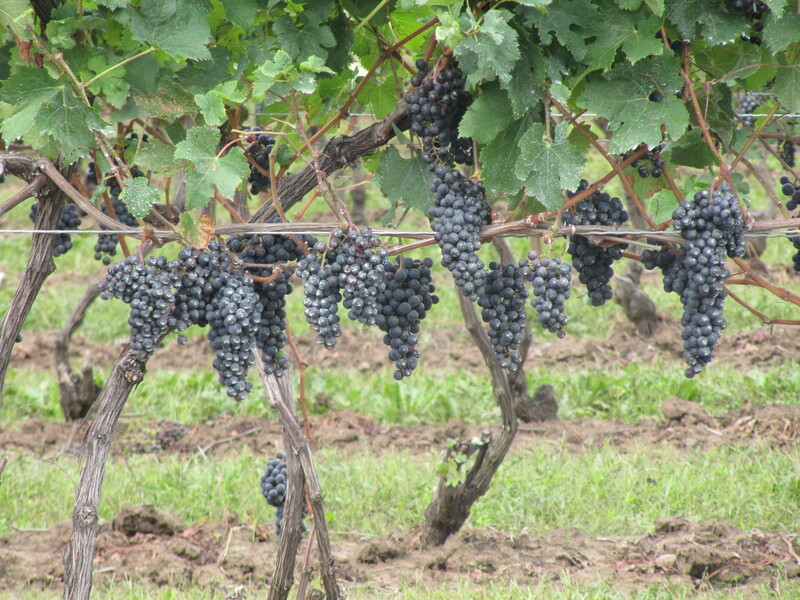 We spent the day in Niagara on the Lake visiting wineries as part of the Wine & Herb festival. We’ve been going for a few years now and it’s always a treat. We stopped at Thirty Bench on the way to NOTL and picked up some Riesling (Steel Post) and Winemakers’ Red (2008 and 2009). 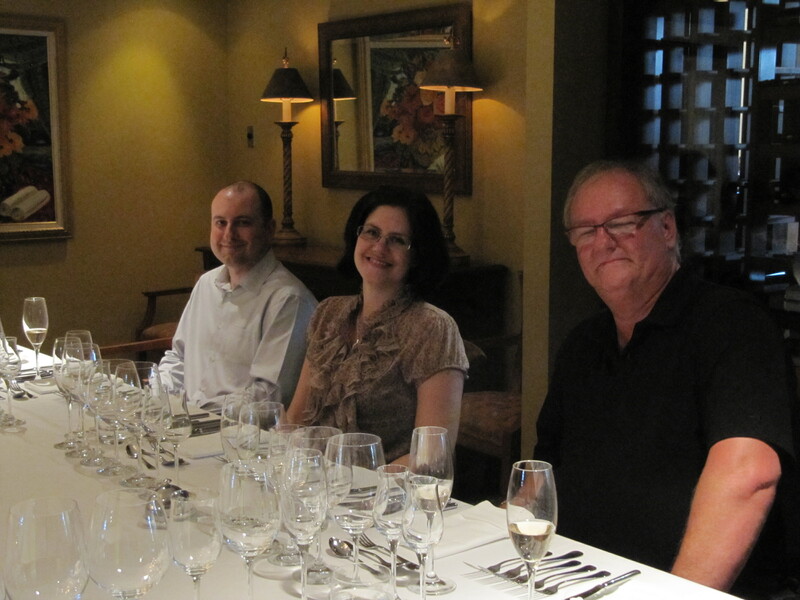 We also got to taste the new 2011 Riesling and 2010 Winemaker’s Red – a nice treat! 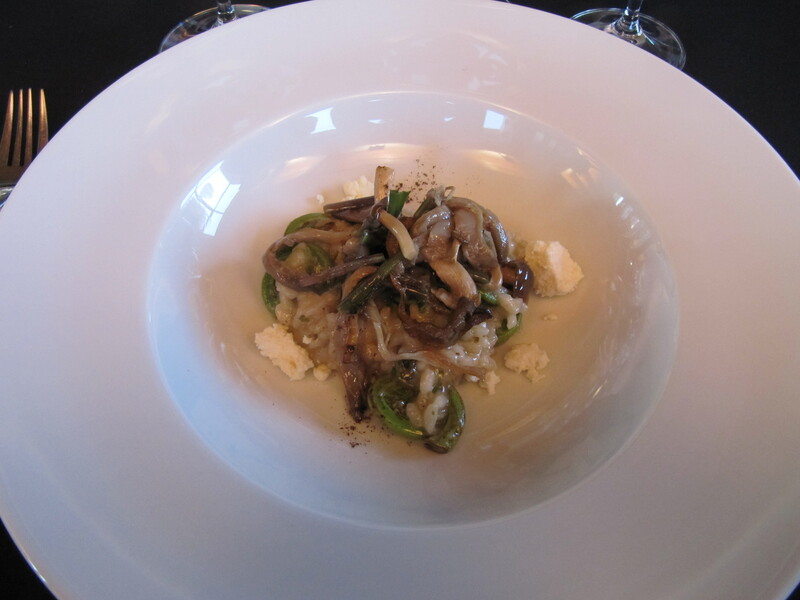 We stopped for lunch at Ravine (I had the delicious grilled vegetable poutine again) then off for more wine tasting! 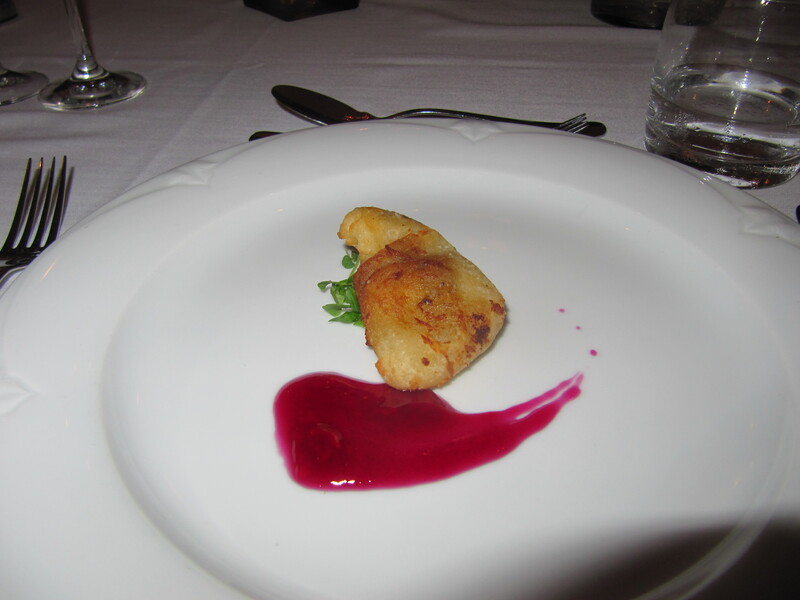 A fun surprise was the 2011 Pinot Noir Rosé at Inniskillin – it actually smelled like bubblegum! My favourites of the day were the pairings at Colaneri and Ravine. The month of May marks the time for the Wine & Herb festival in Niagara on the Lake. The herb pairings have been posted (the specific dishes, not yet) and tickets are on sale now! For Valentine’s day. we celebrated yesterday by spending the day in wine country, touring the wineries in Niagara on the Lake and enjoying the Wine & Chocolate festival. On the way there we stopped by one of our favourites (Thirty Bench) to stock up on some Riesling and Winemaker’s Red. We also had lunch at Ravine (our usual lunch spot when we’re in the area) where I enjoyed a fantastic and decadent grilled-veggie topped poutine – very tasty! Sweep your sweetie off her (or his) feet. Winery Chef and CityLine personality Jason Parsons is ready to help. Experience the romantic setting of the Peller Estates Winery Restaurant while enjoying a sumptuous menu inspired by this special time of year. 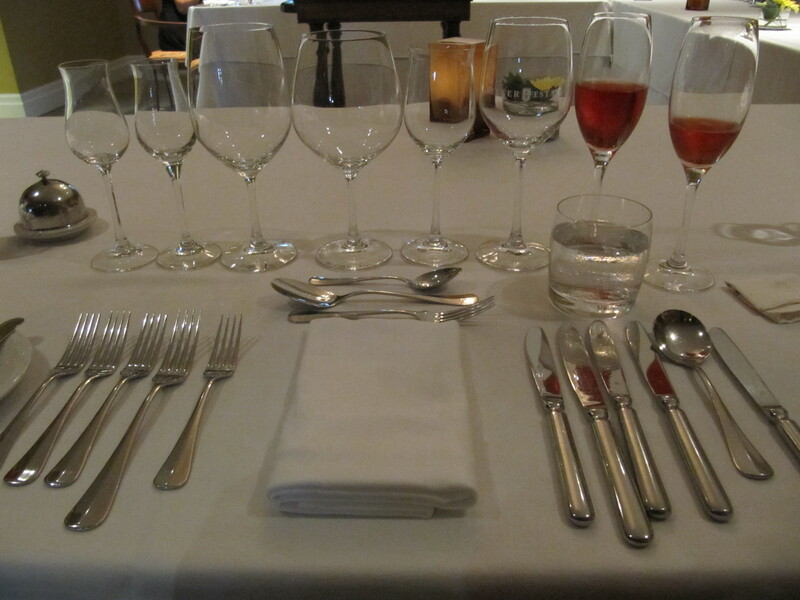 We enjoyed a fantastic 5-course tasting menu (I chose the optional wine pairings add-on) and by the end of the meal, we were stuffed! Throughout the day, we replenished our wine stocks for the coming months. It’ll soon be February and that means – it’s time for the Days of Wine and Chocolate festival in Niagara on the Lake, which I love, love, love! We’re probably going to go down on two separate weekends to be able to try as many as possible. We’ve already purchased our tickets and we’re looking forward to tasting some of the delicious pairings below. My husband and I have flagged a few particularly interesting ones (in pink) although they all look amazing! 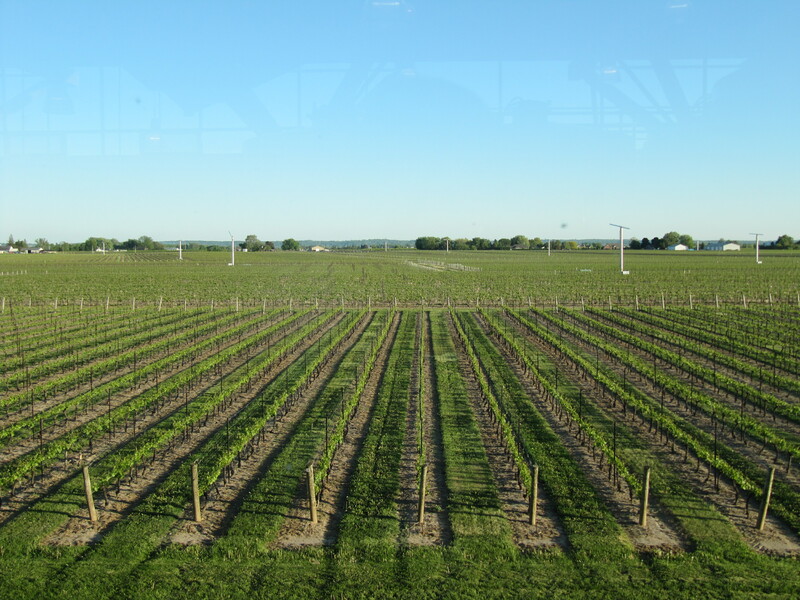 We had booked the following wine dinner for Saturday night at Peller and decided to make a sleepover out of it and spent the day Sunday touring some wineries and ending with a guided tasting at Thirty Bench. Come behind the scenes at Peller Estates Winery Restaurant and discover how Winery Chef and CityLine personality Jason Parsons approaches the art of pairing wine and food. Your dining experience begins with a reception in Jason’s kitchen where he will discuss collaborating with winemaker Lawrence Buhler and his approach to developing innovative food and wine pairings. You will then enjoy a seasonally inspired tasting menu presented by Jason and perfectly paired with wines selected by Lawrence. Jason welcomed us and gave us a tour of the kitchen, explaining what happened at each station and the pass (his spot). 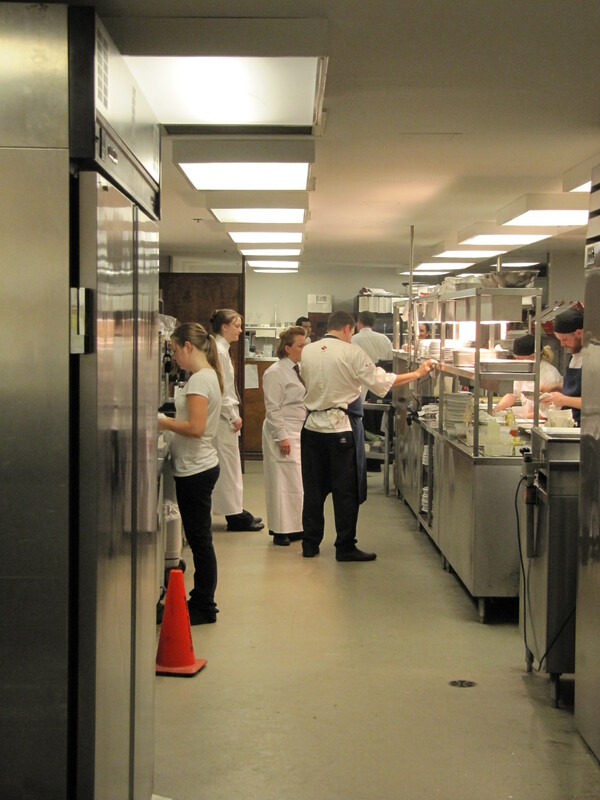 Our chef’s table was in a room adjacent to the kitchen and the doors were kept open all night. 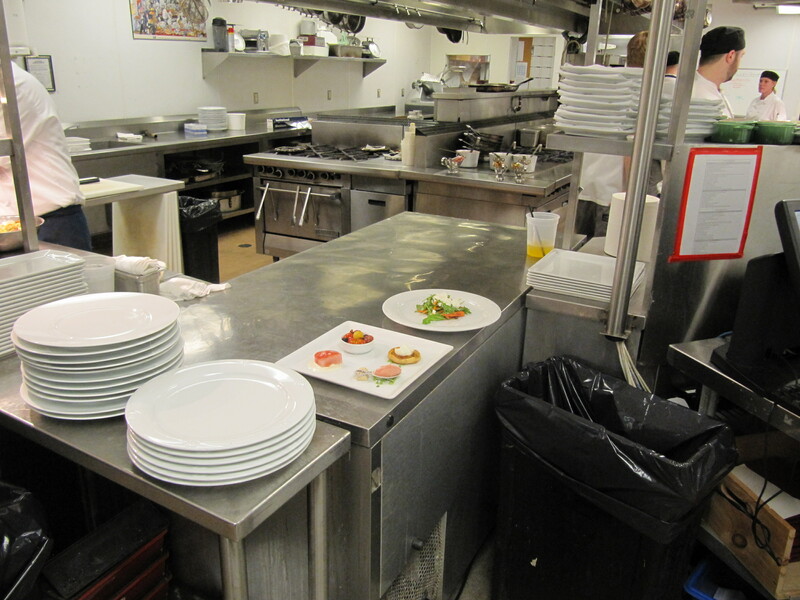 We were encouraged to walk around the kitchen anytime we liked throughout the evening, talk to the staff and ask questions. It was fantastic! 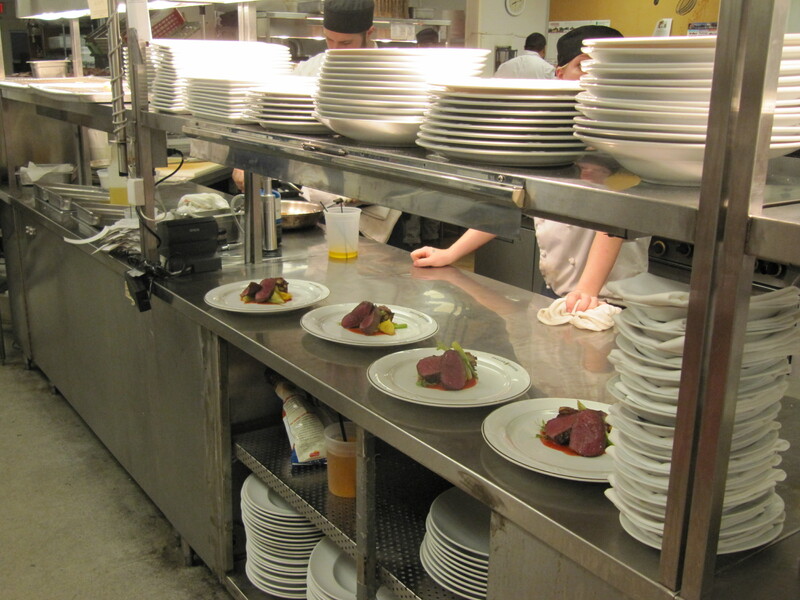 View of the kitchen. That's Jason at the pass. This was one of the most enjoyable meals I’ve ever had. 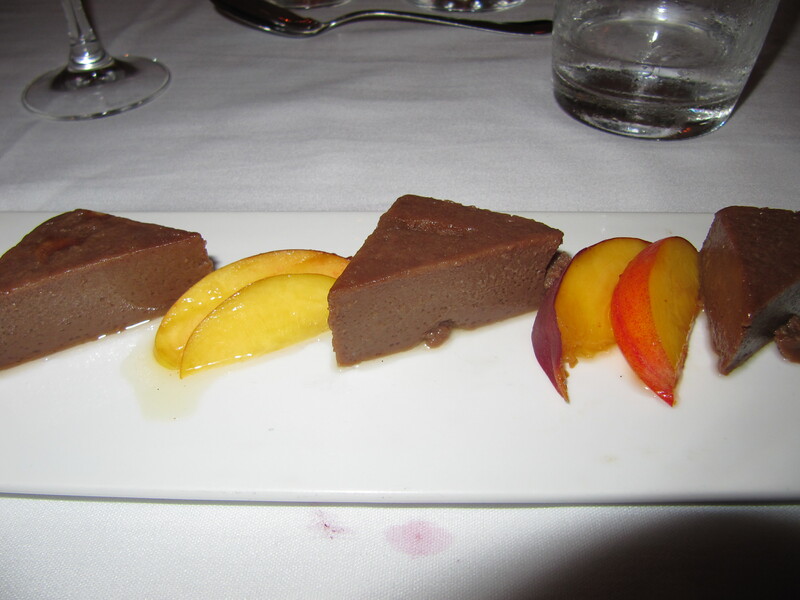 Everything was fantastic, the food, the wine, the staff – all superb. I would highly recommend it to anyone thinking of visiting Niagara on the Lake and looking for something to make it extra special. 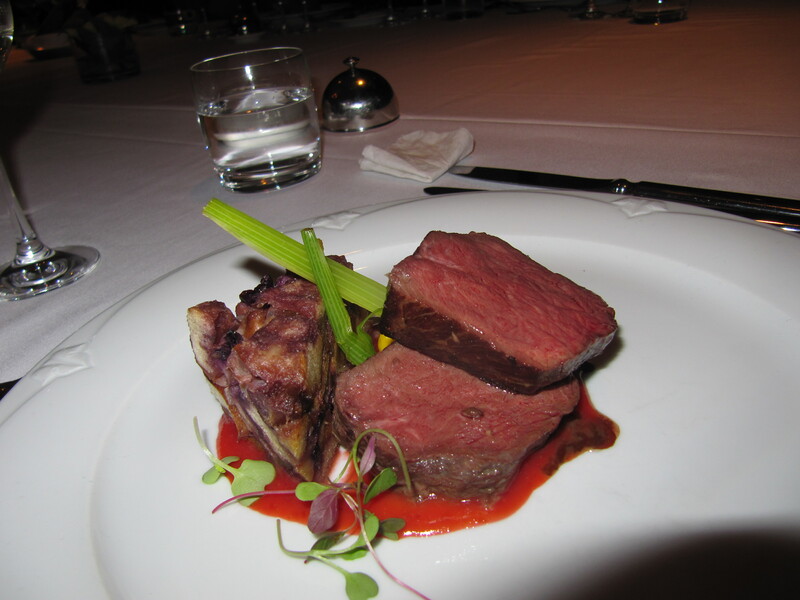 We’ve visited Peller many times including three of their dining experiences and they always deliver memorable, elegant and top of the line food, wine and service. Just fabulous. 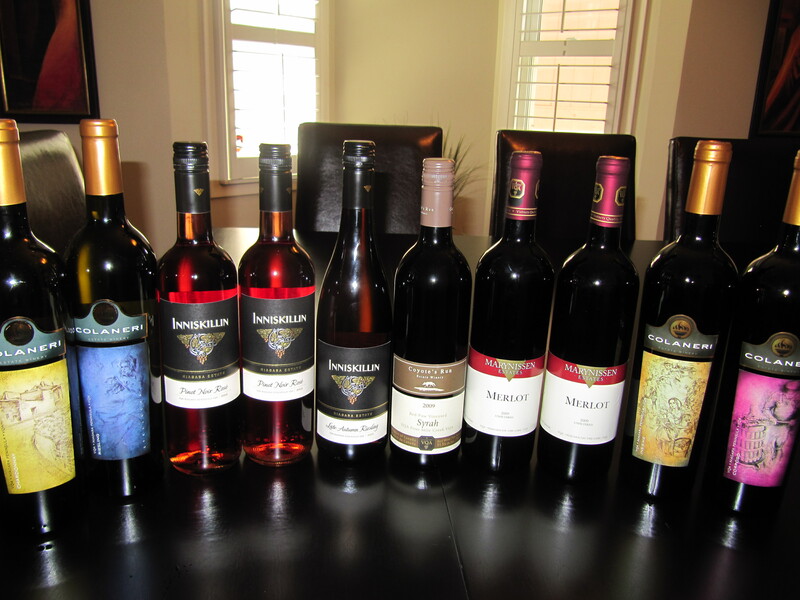 We decided to visit some wineries, some new and some old favourites to stock up on wines. We stopped at Konzelmann, Hinterbook, Ravine (lunch) and Maleta. Then headed over to Beamsville and visited Fielding and Thirty Bench, where we enjoyed a guided tasting.